The German weekly WirtschaftsWoche earlier this week revealed that former Enterprise Commissioner Günter Verheugen has set up his own EU lobby consultancy firm, the European Experience Company. Verheugen started the new firm in April 2010, just two months after he ended his term as Commissioner, but did not inform the Commission about this. According to WirtschaftsWoche the Commission is now investigating whether Verheugen has violated the Code of Conduct for Commissioners. WirtschaftsWoche quotes MEP Inge Gräßle who comments that this will mean that “now, anyone with money can buy access to the institutions through Verheugen”. “The Commission must start considering how it can protect itself against ex-Commissioners,” Gräßle told WirtschaftsWoche. The issue has led to significant controversy covered in the German and Austrian press. In the German daily Handelsblatt, the co-director of the European Experience Company Petra Erler (who is also Verheugen’s former head of Cabinet) made a clumsy and unconvincing attempt to counter the criticism. In a letter to Commission President José Manuel Barroso earlier this week, Friends of the Earth Europe (FoEE) stressed that Verheugen’s failure to notify the Commission about his lobby consultancy company is “a clear breach of the rules”. Internal Commission documents released to FoEE under freedom of information rules show that the Commission in April explicitly asked Verheugen to inform them about “various activities that you may consider within the year”. Verheugen responded by sending information about four new positions he was taking up, but did not mention the European Experience Company. 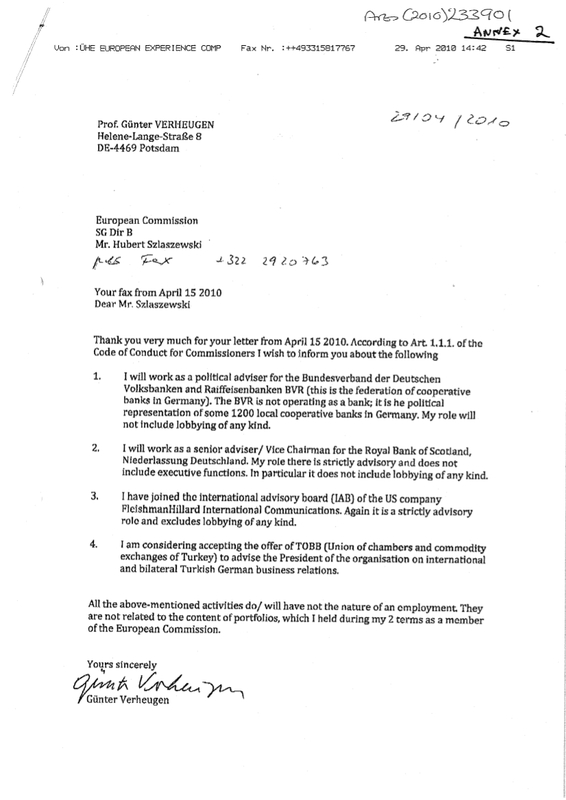 After a rather superficial assessment procedure, the Commission on July 7th informed Verheugen that it had approved his move to the four jobs which were with the Royal Bank of Scotland (senior adviser and vice chairman of Global Banking and Markets in Europe, Middle East and Africa), global lobby consultancy Fleishman-Hillard (member of international advisory board), the Turkish Union of Chambers and Commodity Exchanges (adviser) as well as a German banking lobby group (adviser). Ironically, Verheugen’s responses to the Commission were all sent from a fax machine with the sender message “EUROPEAN EXPERIENCE COMPANY”. But nowhere in the correspondence does he mention his involvement in this new company. In the German daily Handelsblatt, Erler made an unconvincing attempt to counter the criticism, which she described as “insinuations” and “a fairytale”. She also disputed whether Verheugen should have notified the Commission about the company, arguing that she informed the Commission on August 30th. But this would mean she only notified the Commission after the critical article in WirtschaftsWoche had appeared. Erler tried to argue that Verheugen would not need authorisation anyway, as he is not employed by the company: “for Mr Verheugen this is just an investment. He is a shareholder”, Erler told Handelsblatt. This raises the question why the website of the European Experience Company presents Günter Verheugen as managing director? Friends of the Earth Europe in their letter to Barroso also asked for clarification about Petra Erler. According the EU’s Staff Regulations, high-level officials like Erler need to get permission before going through the revolving door, although like for Commissioners there is no clear cooling-off period. Friends of the Earth, as well as Corporate Europe Observatory, LobbyControl and other watchdog groups have called upon the Commission to intervene and block Verheugen’s involvement in the lobbying firm, but it remains to be seen whether the Commission will make any serious assessment of the very obvious potential conflicts of interest. The way in which Verheugen’s other four positions were given the green light does not bode well. When the Commission in April requested clarification from Verheugen about these four jobs, he replied with a brief letter stating that these jobs “will not include lobbying of any kind”. When the Commission asked him for additional information in early June, Verheugen sent back atwo-page response in which he claims that FleishmanHillard chose him for his “professional life-time experience” (as opposed to his 10 years as one of the most powerful European Commissioners?). He repeats that all the jobs “explicitly exclude any type of any lobby”. At the same time, however, many of the activities which Verheugen stated that he would be doing for his new employers sound very much like giving lobbying advice. The description also includes speech-making and other public outreach for his new employers. Amazingly, the Commission’s Ad-hoc Ethical Committee endorsed Verheugen’s explanations without further questions or comments and concluded categorically that the four jobs “do not entail any risk of conflict of interests”. The Commission accepted this and informed Verheugen that he had been given green light. The Commission’s Ad-hoc Ethical Committee, led by former Commission official Michel Petite who himself went through the revolving door in 2008, clearly has a far too lax attitude to conflicts of interest. The website of the European Experience Company states that it “will not engage in any kind of lobbying activity”, but this is contradicted by the services offered elsewhere on the website. The company is actually entirely focused on assisting lobbying efforts to influence EU institutions, ranging from lobbying advice to more active engagement. It assists “top leaders of public and private institutions and enterprises” with EU lobbying efforts, for instance via “Intensive management seminars for institutions and enterprises in cooperation with experts from European institutions”. It also offers “strategy recommendations in the area of EU-policy and other political matters” and “support for your public relation endeavours in European affairs (speeches, media events, publications)”. The European Commission – in the context of its transparency register - defines lobbying as “actions initiated with the aim of influencing European policy formulation or decision-making processes ”. Verheugen is one of six Commissioners from the previous Barroso Commissionthat have moved into private sector jobs which might entail conflicts of interest (out of the 13 Commissioners that left in February). In WirtschaftsWoche MEP Inge Gräßle calls upon the Commission to tighten its Code of Conduct and introduce a cooling-off period for job moves that involve conflicts of interest. Commission President Barroso last September promised such a review, but 12 months later there is still no sign of this. Also a review of the EU’s Staff Regulations is said to be underway, but so far the Commission has rejected any need for stricter rules to prevent conflicts of interest. A common-sense solution advocated by the ALTER-EU coalition would be to introduce a three-year cooling-off period for ex-Commissioners wanting to move into private sector jobs that involve lobbying or lobbying advice.